A general misconception of innovation management is that in order to become innovative, you just need to generate a lot of new ideas. While there’s nothing wrong with that per se, it’s only half the battle, as it’s the execution process that really matters if you want to transform an idea into an actual, value-creating innovation. If you think about, for example recruitment, finding a handful of potential candidates among a large pool of talents is a great start as this alone can often be quite a challenge. However, with a good recruitment process, you’ll ensure that you find out what makes each individual tick on a personal level. This is much more important in terms of finding the right match for the position than sheer skill alone. Innovation management is no different. 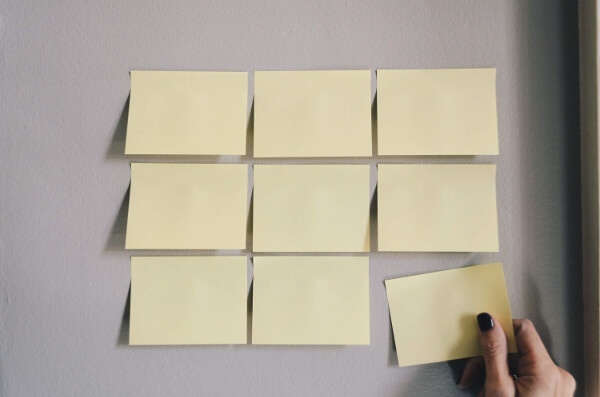 Just like having a well-managed recruitment process is vital for finding the right candidate from a handful of good ones, an idea management process is vital for turning potential ideas into successful innovations. In this post, we’ll look into some of the commonly used innovation management processes. Since each innovation management process is significantly different from the others, I'm covering slightly different aspects for each one. What exactly is an Innovation Management process? Why use a systematic innovation management process? Where is the Phase-Gate process used? How to succeed in managing the Phase-Gate process? Where is the Lean Startup model used? How to succeed in managing the Lean Startup model? Before discussing more about different types of innovation management processes, it’s important to define what we’re really talking about. Although there are several different ways to do that, I like the following definition in all its simplicity. A systematic approach for generating, prioritizing, evaluating and validating new ideas, as well as putting them into practice. What I’ve discovered is that there’s not only one way to innovate. Different companies rely on different kinds of processes to manage innovation, some obviously being more successful than others. After all, innovation is only as successful as the process behind it and without a solid one, it’s difficult to avoid chaos and frustration. 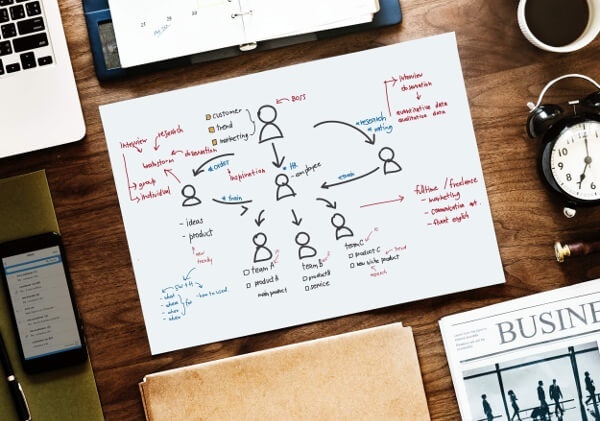 A structured innovation management process guides you through the whole innovation life-cycle, helping you to make better decisions, remove the bottlenecks, enhance your efficiency, reduce risks and move faster by simplifying the otherwise complex process. 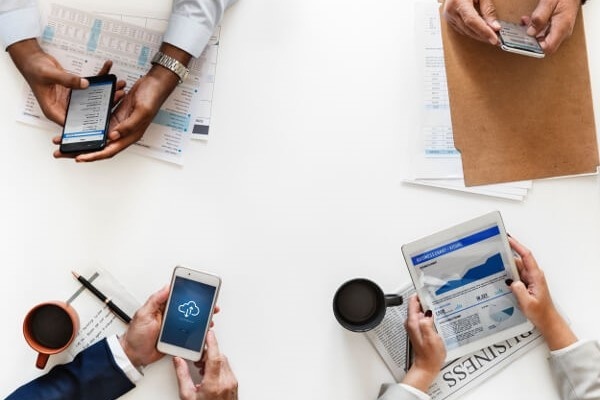 Needless to say, not all organizations benefit from all types of processes and choosing the right ones depends on a number of things, for example the way your organization currently operates and the business you're in. It should be mentioned that the processes introduced in this article are usually a solid starting point when it comes to incremental innovations but may not always be applicable if you're looking for innovations of a more disruptive nature. Without further ado, let’s get to the core of the most common innovation management processes. Looking at the matrix above, innovation management process classification generally has two sides. On the other side of the spectrum are lean and agile pull-based processes, whereas on the other side are more rigid and formal, push-based processes for managing innovation. As already mentioned, innovation management processes can be divided into push and pull-based models. Simply put, push-based models are more internally and technologically oriented approaches, whereas pull-based models are more customer and market-oriented approaches for managing innovation. In other words, ‘technology push’ models are the ones where the product or service is at the core of innovation work, usually driven by internal R&D activities, whereas ‘market pull’ models are driven by external market forces, designed to find (and meet) market demand. The main distinguishing factor between push- and pull-oriented models is the way they aim to resolve the challenges in the market. Push-oriented organizations are usually already aware of (or at least presume to be aware of) the challenges and the users. They are also focused on searching for the best ways to address these challenges, usually with new technology. Classic examples of push-oriented organizations would be Apple and most of the pharmaceutical companies. It should, however, be kept in mind that not all push-oriented organizations are traditional, established ones, as there are also a number of different tech-start-ups, working hard for building technological inventions to solve problems that require such an approach. Pull-oriented organizations, in contrast, are looking for ways to adapt to changing markets and customer demand, and are usually focused on listening to customers, learning from them and moving fast in their innovation work. Pull-based innovation processes are usually adopted by organizations that are operating at an early stage and bear a greater risk, such as start-ups or more radical initiatives within larger organizations. But which approach is better? What are the pros? The cons? The majority of the large, established, push-oriented organizations have their own dedicated innovation units, constantly and solely focused on launching new products and solutions as well as other incremental innovations to the market. These types of organizations usually have more resources at their disposal, and are therefore able to exploit already existing machinery, distribution channels and other resources, which is the only effective and profitable way for them to innovate. Another huge advantage is that because of this, they have chances to launch new innovations before competitors have even had a chance to think of them. Push-based organizations in general have better chances to lead the market development, because they don’t have to start from scratch. The biggest downside, or should I say, challenge, most push-based organizations face is the expensive technology. Technology inevitably requires a lot of investment and testing, resulting in longer time to market. Also, regardless of how great the solution might be, organizations operating in highly supervised industries may not be able to move as fast as they would like to due to strict regulations. However, push-oriented organizations can, in some cases, be able to launch new innovations relatively quickly. This is possible in cases where they know what needs to be done without having to spend time on market research. Another, not-so-obvious, (but definitely noteworthy) challenge is the risk of building something no one actually wants or isn’t willing to pay for. 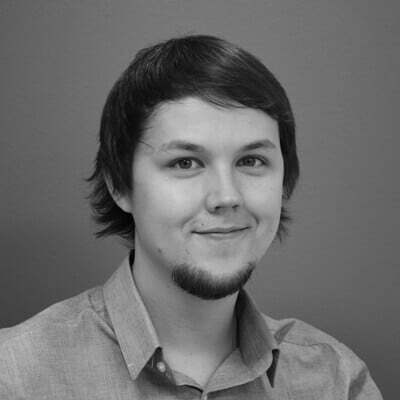 Because push-oriented models aren’t focused too much on testing the assumptions and how the product would actually fit the market, it’s not guaranteed that people would be interested in your solution if the problem it’s solving is not significant, or the approach to solve it isn't simply effective. Because of faster time to market, pull-based models typically require less investment compared to push-based models. Pull-oriented organizations often have smaller marketing budgets and in general smaller operating costs. Because of this, organizations are able to make rapid changes due to agility and flexibility, which again improves the overall efficiency and productivity. In addition, as opposed to push-based models, pull-oriented organizations have the ability to quickly learn what potential customers want and are willing to pay for, which means that the risks of building something the customer doesn’t want is dramatically reduced. One of the trickiest aspects here is that because pull-oriented organizations rely on external feedback, gathering relevant data can take a lot of time, energy and other resources, which is why you need advanced abilities to be able to critically analyse all the data. It can be challenging to define which amount of data is enough, and if it’s actually even relevant. Without a critical eye, you easily make false assumptions if your decisions are solely made based on external feedback from your stakeholders. At worst, this might even increase the risk of ending up building wrong types of solutions for your customers. As you can see, there’s no better or worse here, just different. Both types of models have different characteristics, challenges and advantages, and because they are aiming for addressing dissimilar challenges, they can only be compared to some extent. The Phase-Gate process (or “Stage-gate”, also known as the “the waterfall” under certain circumstances) is probably the single most famous process for product innovation. With variations, this process has been around since the 1940’s and is based on the undeniable fact that there are always more ideas than there are resources. The Phase-Gate is implemented across a number of industries by companies of all sizes and it falls into the ‘technology-push’- field on the right side of the matrix we spoke about earlier. The Phase-Gate process is mainly used for idea development to reduce project uncertainty and cycle time in development of new ideas and often works well in situations where the ideas are similar by nature. It’s a roadmap that organizes the innovation process into small, more manageable stages and works well for keeping a commonly agreed set of standards, adding clarity to an often-times fuzzy process. The ideology behind the Phase-Gate is that each idea will have to go through certain pre-determined phases in their development. At the end of each phase, there is a “gate”. When the idea reaches a gate, it will be assessed by using certain pre-determined criteria. If the idea passes the assessment, it will receive additional investment and is able to proceed to the next phase. In the discovery stage, a new innovation is discovered, and the initial idea is screened for the first time. After the idea has passed the first gate, the scope will be defined, and the improved idea is screened for the second time. When the scope of the idea is accepted, it moves to the feasibility phase, where a business case is built, and the innovation goes to development. In the fourth phase, the new innovation is developed further, after which it goes to testing. When the innovation has been validated based on pre-defined criteria, the final innovation is launched to the market, after which post-launch reviews are made. The Phase-Gate ensures consistency among your ideas and guarantees that each innovation matches the general standards. It helps eliminate ideas that are obviously bad, as well as identical problems, making both project and portfolio decision-processes smoother. Organizations using Phase-Gate process in their innovation work, have been able to increase the organizational awareness regarding innovation, which has proven to promote transparency, improve collaboration, and enhance overall innovation culture. One of the challenges regarding this particular process is the standardization of the “gate criteria” and metrics. Standardized criteria can easily lead to approving similar ideas (often incremental and easily understandable ones), which can be argued to fight against the nature of innovation. As mentioned earlier, this approach is nearly impossible to be implemented to more disruptive innovations as they are by nature very different from anything that you're currently doing. The Phase-Gate is a perfect example of a process that can easily lead to the innovator’s dilemma under certain circumstances. For this exact reason, ideas tend to often be similar in nature, which suits an operating environment that is highly predictable, and challenges are more technical in nature. Also, because testing usually happens at the end of the process, there might be a long time before you’re able to see if your innovation actually works or not and any changes that might be required at this point are often extremely costly and can lead to long delays. How do you succeed in managing the Phase-Gate process? Carefully define and mutually agree to your gate criteria to avoid costly changes later on. Remember to prioritize – focus on improving your portfolio management by picking the right projects. Pay close attention to your product validation criteria before moving to the implementation phase. Don't try to force all innovation within the company through the same phase-gate process (for example new products and improvements to existing processes are simply very different from each other). On the other end of the spectrum from the phase-gate, there are people who believe that the best innovations come from simply equipping smart people with enough time and the right resources to make their ideas happen. The majority of processes are somewhere in between these two, so we’ll share another model that many organizations have adopted recently, this one closer to the left, less formal side of the matrix, namely the Lean Startup. While the Lean Startup usually isn’t specifically labelled as an innovation management process, it is designed to aim for virtually the same goals as, for example, the phase-gate process. The Lean Startup Model is a concept for product and business development, proposed by Eric Ries in his bestselling book bearing the same name. 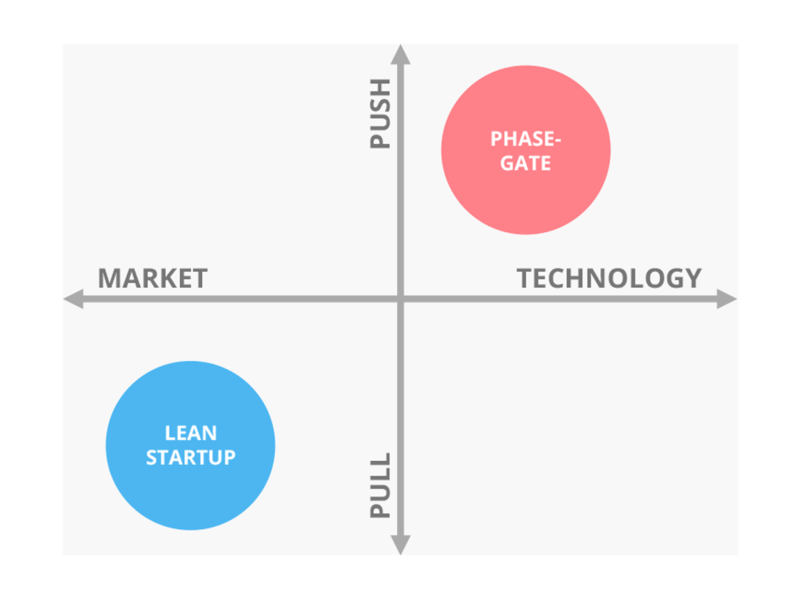 The Lean Startup model is designed to address market risk and customer demand fast to find the product market fit as soon as possible and is much more pull-oriented than the phase-gate model. Instead of focusing too much on launching a complete, final product, the Lean Startup model focuses on finding the customer need and promoting the speed and urgency in idea search to avoid spending too much resources on something that isn’t of interest of the target customer. The main idea of the Lean Startup model is to rapidly test and validate the assumptions related to the product-market fit between your innovation and your target market, as well as the related business model in order to learn and adapt as quickly as possible. 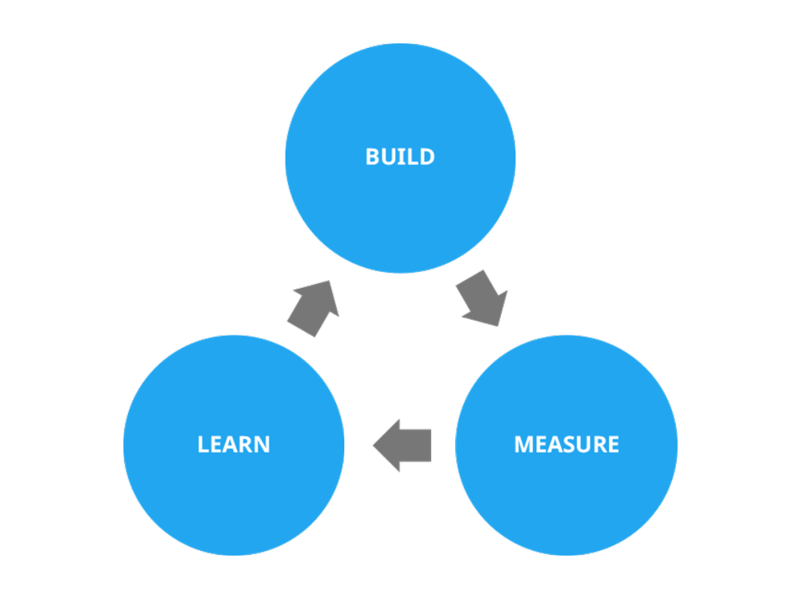 Build-measure-learn feedback loop is the main component of the Lean Startup Model for building and testing new ideas. The core ideology behind Build-Measure-Learn Feedback Loop is to launch a new idea or concept to the market as quickly as possible to gain experience and gather feedback for further improvement. It is crucial to remember that instead of testing an existing product, you should start by testing the value proposition and core assumptions regarding the demand of your product or service. After you have validated your idea, this loop is repeated as many times as necessary, constantly testing and developing further the previous version of your product. With the help of this loop, you can validate your ideas and quickly learn where to direct your efforts without having to invest a ton of money and other resources. Minimum Viable Product (MVP) is defined as the version of a new product a team uses to collect the maximum amount of validated learning about customers with the least effort. In other words, it’s a basic version with the smallest number of capabilities that will deliver enough value to potential paying customers who will give you feedback. Introducing a minimum viable product is the opposite of taking a lot of time to build a finished product, hoping the customers to come to you. It’s often less expensive and faster way to test if the product or the business model should be built in the first place, and if it should, it helps you to decide what to do next. 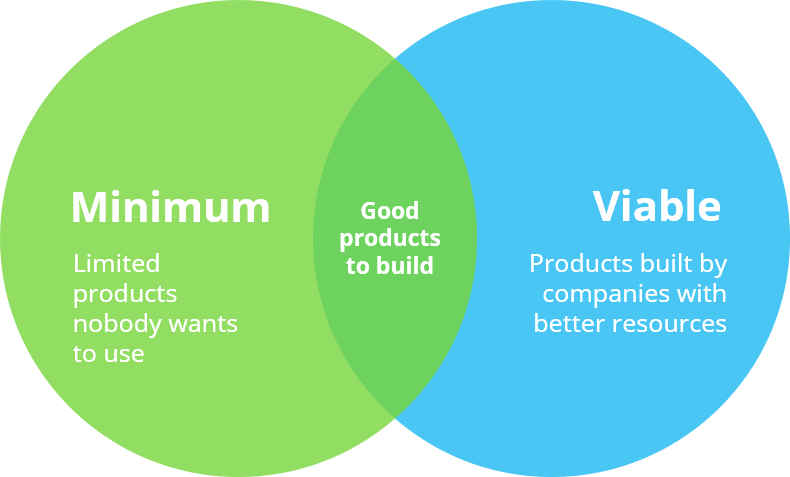 In other words, MVP can be described as the smallest product completing the build-measure-learn feedback loop. While Minimum Viable Product is a solid approach for figuring out whether or not you have an actual business, Minimum Desirable Product (MDP) is more customer-focused approach, as it's focused on finding out if your product is actually able to provide a satisfying, high-value user experience. With Minimum Desirable Product, you'll be able to test what benefits you're actually providing for the user and whether or not your product is desirable enough for them to actually use it. In other words, it can be viewed as the simplest product that has a credible shot at providing product/market fit. Lean Startup model is especially well-suited for organizations that operate in an unpredictable, complex and rapidly changing environment with limited resources. Because the methodology focuses on moving quickly and testing assumptions in real life to minimize risk of building something that doesn’t work or doesn’t meet the “requirements” of the market, highly regulated industries (such as pharmaceuticals) might not benefit from the Lean Startup, at least in the same way that a software startup might. However, if you don’t yet have a very good understanding of what you want to accomplish, for whom and why it would matter to them, the Lean Startup method can be a solid candidate for a starting point. The primary benefits of the Lean Startup model is that it’s a quicker way to learn what works, providing the ability to make decisions based on real evidence and data. Feedback comes straight from stakeholders, which increases the ability to observe and respond to customer behavior, delivering better results to customers and further increasing customer loyalty. Organizations that are implementing the Lean Startup model are able to increase the speed of development and reduce development costs with a certain flexibility in changing ideas, thus dramatically lowering the overall risk of innovation. The Lean Startup model can be a tremendous help in prioritizing ideas as well as making decisions faster in order to avoid lengthy and unnecessary projects. Despite the slightly misleading name of the Lean Startup Model, it’s not only meant for young enterprises. In fact, according to Innovation Leader survey, over 82% of the respondents (consisting of executives in large organizations) have used the Lean Startup Methodology one way or another in their organization. 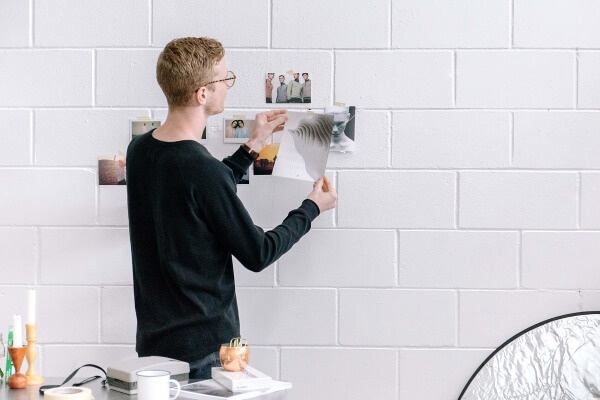 Although it’s important to keep in mind that the purpose of a mature company is different from startups, the ones adopting the Lean Startup methodology have been able to enjoy positive results. GE is just one great example of a large enterprise that has successfully implemented Lean Startup initiatives throughout the whole organization to celebrate the agile and transparent characteristics of a startup. GE launched their FastWorks program together with Eric Ries in 2013 and started by coaching thousands of executives on it. The ideology behind GE FastWorks-program is to develop an MVP with the lowest cost and fastest time to learn and iterating solutions based on real findings. 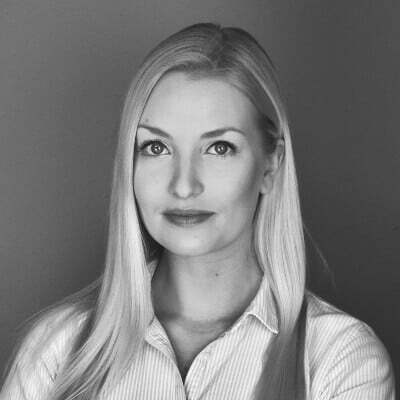 By doing so, they have been able to cut development costs by up to 60%, saving millions, and were also able to launch hundreds of new FastWorks projects globally during the first year. Although general results have been positive, some of the organizations have also faced some challenges when trying to implement this model to their business and product development tactics. The main challenge that some organizations are concerned about is showing customers products that are “not complete”, thus failing to consider their projects as MVPs. In general, large organizations are structurally different in the sense that they’re not able to move as fast as leaner companies. Decision-making and resource allocation may take more time because people are often used to making decisions based on prior experience, estimates, forecasts and theoretical research and these tendencies overruling the use of real world evidence that is crucial for to the Lean Startup, is one of the key challenges many large organizations face. As Eric Ries stated, the ones who have succeeded in managing the Leans Startup Model have been able to just follow the continuous learning process. If you want to succeed in managing the Lean Startup Model, you should acknowledge and accept that your business model is most likely to evolve and change the more you learn. Your success is based on feedback, but also execution, which means you need to be flexible and not be afraid of making quick decisions when you learn more about what works and what doesn’t. You should, however, keep in mind that in order to succeed, you cannot be chasing after millions of different opinions. Keeping a balance between feedback and your vision is vital if you want to get things done. The process of figuring out the right innovation management process, or processes, can be a challenging effort. As innovation is, by nature, highly unpredictable, the only way to see how a certain process could work for you is to try it out in real life. 1. Analyse and internalize your current situation. Are you working in a small or large organization? What are the most important strategic goals in your industry? How many different processes do you need and who will be involved in the beginning? 2. Educate yourself on all the processes. Have a look at the existing case examples, as this helps you to learn from other’s successes and possible mistakes they’ve made down the road. Start with those that have been proven to work for the types of industries and organizations you’re operating in. 3. Use the information you’ve gathered. Pick either one process off a list or compile the best elements from what you’ve learned to create your own process. Don’t make things too difficult for yourself in the beginning. Unless you already have a clear vision for where you want to start from, it's better to start with a simple innovation management process. You don't need to announce company-wide processes right away! Start by testing these aforementioned processes first in smaller units or through shorter trials especially if a large organization is in question. Through trial and error (and, of course, with a little risk, as without it nothing game-changing can be achieved), start doing wider trials and implementations. 6. Keep testing and don’t give up! If you’re working in a larger organization, you’ll almost inevitably need more than just a single process for the different types of innovations in different parts of the organization, so there’s no point in trying to fit everything to a single innovation pipeline. Just start simple in one area of the organization and adapt as you learn how the process works. There’s no point in being concerned about getting everything just right from the beginning as it’s very unlikely to happen. 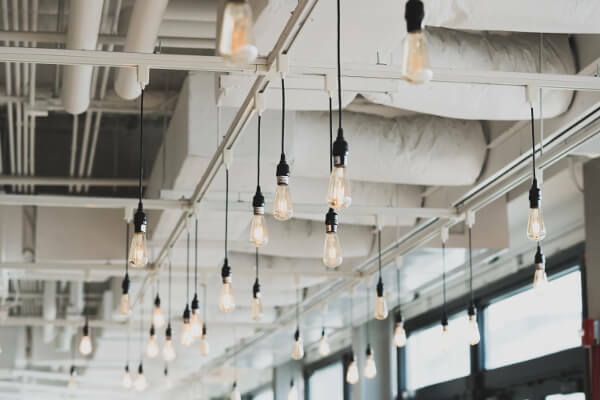 Innovation management processes, however, are a topic that we’re still planning to revisit later on, especially as the new ISO 50501 standard for innovation management is currently under development. While we have high hopes that the ISO standard could consolidate the terminology in the innovation field, we are also curious to see how the standard will turn out as there’s a certain irony to there being a “standard process for innovation”. How can you standardize innovation management, as for it to be successful, it should always be defined case-by-case? It’s not a thing that can just be repeated to the letter off a manual. You only need instructions to understand what you’re doing and why and only then you can create a process that works for you. Although finding the right process for innovation management may seem difficult to begin with, the idea is not to religiously follow just one of them. Instead, take some time to test the most promising one and combine different characteristics that might work best for your purposes. Innovation management processes are no different than any other processes in a sense that they are most likely to evolve over time. When you execute, you constantly make changes based on your learning. So, make sure you have all the relevant information you need, start with what needs to be changed first, and don’t sweat it if it’s not perfect from the get-go, as there will always be room for improvement. In case you'd like to discuss more about innovation processes (or anything else! ), our team is always happy to help!